The Aries Moon natives emotions are often expressed through physical action and experiences. Aries Moon Signs have the reputation of action that can be motivated by "instant gratification. Aries, relentlessly pursue their desires with the passion and energy of impatience. They want it, and they want it NOW. Boredom and mediocrity just do not cut it in their world. Thus Aries prefer eccentricity in their lives, rather than conventionality. Aries Moon signs attract and are attracted to other passionate, physical and active people. Daily routine is not something they relish or fulfill with diligence. Their emotions are fed by their innovative spirit. Impetuous would be an apropos adjective for an Aries native. For the short term, they can become passionately involved with people and projects, but long-term commitments may make them feel imprisoned and at times smothered. Their quick tempers are often ignited by their impatience. As quick as they are to anger, they are just as quick to forget. Aries Moon personalities have sheer determination to reach their goals. They are meant to be masters of their own success or failure in life. However, their emotional security is masked to the outside world. On the surface, an Aries Moon may appear aggressive and somewhat self-serving, but this is a cover-up for real vulnerability and insecurity. Aries talk is tougher than their walk. When dealing with the aggressive Ram remember that within every Aries Moon sign there is a gentle lamb. Due to its Fire Sign aspect, Aries Moon signs natives may not be as intuitive as other signs. 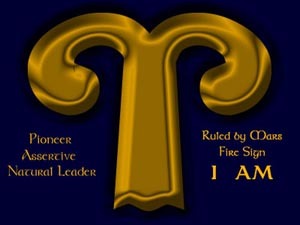 But Aries does has an advantage over the other signs. Mars is the ruler of Aries and is the god of animal husbandry. As a result the Aries Moon native often possesses an ability to understand and heal the animal kingdom. In return, the animal kingdom offers the Aries Moon native the benefits of soothing the savage beast within. It is a reciprocal relationship. Animals usually play a prominent role in the life of Aries Moon natives. Famous Aries Moon women: Lauren Bacall, Jamie Lee Curtis, Ellen DeGeneres, Grace Jones, Holly Hunter, Heather Locklear, Jennifer Lopez, Jacqueline Bouvier Kennedy Onassis, Anne Rice, George Sand, Lily Tomlin, Virginia Woolf. Famous Aries Moon Sign men: Louis Armstrong, Kevin Bacon, Antonio Banderas, Leonard Bernstein, Marlon Brando, George Burns, Salvador Dali, Bob Fosse, Galilei Galileo, Jerry Garcia, Bill Gates, Arlo Guthrie, Rex Harrison, Immanuel Kant, John Lithgow, Bill Moyers, Mark Twain, Malcolm X.